This year in Cersaie we meant to enact the spa and beauty farm world. Our intention has been to divide the booth in separate areas in order to show different brands, products and materials. We think we made it… The Vetriceramici showcase was meant as a “water path”, so there’s why blue LED lights lining the floor and essential oil perfumes to recall the pleasant memory of a winter day in a spa. A perfect background to display our materials, that this year especially awakened everybody’s interest. First of all, marbles, among which the “Rosso Lepanto“, a marble decorated with the new CRIMSON RED digital ink and a “Krystal” finishing, and then polished to shine. 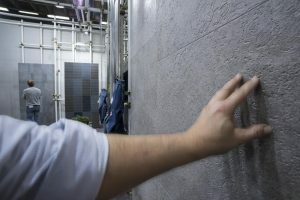 This same product we proposed in 60X60 and 60X120 sizes is also suitable for other sizes, and perfect for slabs and bathroom and kitchen countertops. “Marmo Brown”, dark, almost black, but rich in white and gold streaks that warm the overall shade. We presented it in both a matt and shiny finishing, both achieved with a Krystal cover. This is an interesting product from a technical point of view, since full size decoration underneath notwithstanding, the surface is completely flawless. “Verde Saint Denis”, a marble in a 80×80 size by#AnticaCeramicaRubiera with materials fully supplied by us: both digital ceramic inks and ceramic grits for wet application. The most charming product we showcased is the “metal” tile: a metallic effect high-temperature glaze decorated with effect digital inks #inksnova matt, #inksnova white and coloured ceramic grits applied through the Evo Dry Fix digital printer (in this specific case!). Our choice was to display coloured grits in a different and original way and at the same time to promote the wide range available within our catalogue. “Murales” is a product better suited for decoration, to clad and dress walls in different spaces in the house and of course your bathroom, too. An inevitable proposal for terrazzo and conglomerate, “Meda”, that we revisited with shiny and matt effects obtained by digital ceramic inks in order to exalt colours and, moreover, to enrich the surface through microgrits application. Meda is an elegant and classical product right for a refined setting and for kitchen and bathroom countertops or may simply be presented as micro-sized tiles such as 20X20, imitating old-style cementinas. Below on the left the detail of the effects achieved. We are already working for the Cevisama 2018 showcase. See you soon. Cinzia Lugli | Marketing Dept.